Made with 50% real fruit! The perfect snack, healthier than regular sweets and provide a great energy boost. Gluten free and no artificial colours or flavours. Contains 5 lunch box packs. Apricot (50%), Sugar, Glucose Syrup (From Corn), Palm Oil, Food Acid (E330), Emulsifier (E322 from Soy), Corn Starch, Natural Colour (E160b), Natural Flavour, Preservative (E220). These are amazing, very addictive. Can’t seem to find them in the uk. 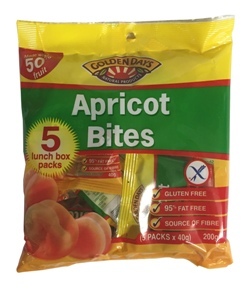 Use to call them Apricot Delights in Australia, at least in Sydney they did. Yummy!